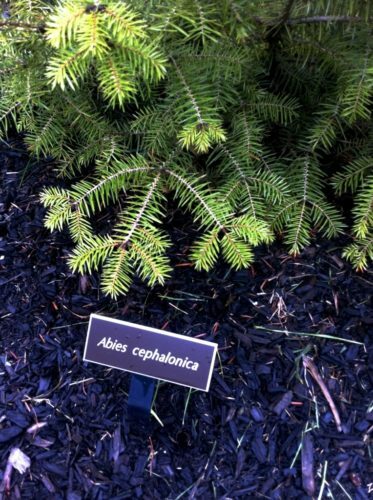 Abies cephalonica, first described in 1838 by John Claudius Loudon (1783–1843), is commonly known as Greek fir or as Κεφαλληνιακή ελάτη in the Greek language. 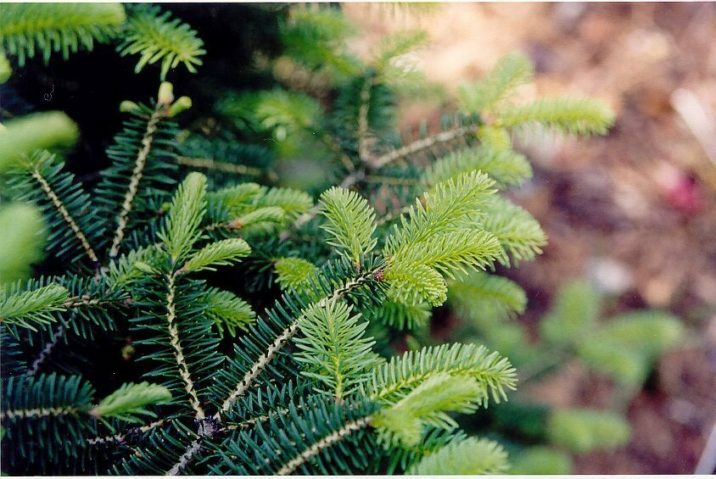 It is closely related to Nordmann fir (Abies nordmanniana) to the east in northern Turkey. Description. 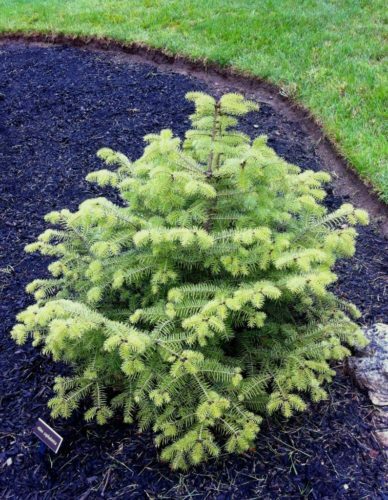 Greek fir is a medium-size evergreen coniferous tree growing to 80 to 115 feet (25 – 35 m), rarely to 130 feet (40 m) tall and with a trunk diameter up to 3 feet (1 m) wide. The leaves are needle-like, flattened, 0.6 to 1.2 inches (1.5 – 3.0 cm) long and 0.1 inches (2 mm) wide by 0.02 inches (0.5 mm) thick, glossy dark green above, and with two Blue-white bands of stomata below. The tip of the leaf is pointed, usually fairly sharply but sometimes with a blunt tip, particularly on slow-growing shoots on older trees. The seed cones are 4 to 8 inches (10 – 20 cm) long and 1.6 inches (4 cm) broad, with about 150 to 200 scales, each scale with an exserted bract and two winged seeds; the cones disintegrate when mature to release the seeds. Distribution. This species is native to the mountains of Greece, primarily in the Peloponnesos and the island of Kefallonia, intergrading with the closely-related Bulgarian fir further north in the Pindus mountains of northern Greece. It occurs at altitudes of 3,000 to 5,500 feet (900 – 1,700 m), on mountains with annual rainfall of over 40 inches (1,000 mm). Abies cephalonica New spring growth on specimen in my garden. Needle detail, Grecian Fur in Steinhardt garden, Mt. Kisco, NY, photographed during the 2013 National Meeting. 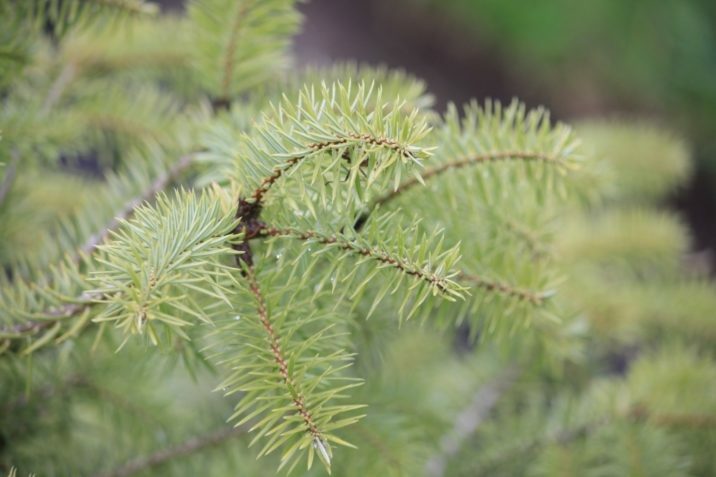 Greek fir in Steinhardt garden, Mt. Kisco, New York, photographed during the 2013 ACS National Meeting.